This is the most common of problems and many homeowners don't know that this problem has the potential to be a very dangerous one. Some older homes sometimes have outdated wiring and are unable to handle the power demands of today's modern appliances, At times we see that the wiring is not hazardous, and a simple "Panel Upgrade" is required, older homes commonly have 60 amps of power, when more modern home's have 100 amps of power or more to accommodate the power demand of modern appliances. 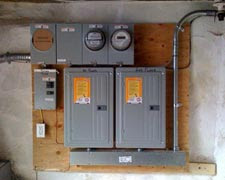 So one way of being safe is to be sure your Panel can handle the current of electricity being used in your home, and assure your wiring is not hazardous, hazardous wiring can cause a electrical fire, that can start in the walls of your home and quickly become uncontrollable and even deadly. So if you find yourself having to constantly reset your breaker due to them constantly popping call us and we will come out to survey your homes electrical system. Here at G3E we promote safety and encourage homeowners to seek the assistance of a licensed professional for all electrical needs.